"One of the most important but under-reported financial indicators is the CBOE’s Volatility Index (^VIX), which measures the market’s expectation of future volatility in stock prices (over the next 30 days). (The CBOE has written a nice technical white paper describing how it is calculated, here.) When it drops below 30 percent, it will be a strong indication that the market correction is complete and we’re back to business as usual." Often referred to as the "fear index," the VIX represents one measure of the stock market's expectation of volatility over the next 30-day period (Wikipedia). The VIX is a widely used measure of market risk and it is often referred to as the "investor fear gauge" (Investopedia). The chart above shows that the VIX Index closed today at 14.26, the lowest value since early June 2007, almost five years ago, and a full six months before the recession started in December 2007. Investor fear has gradually subsided, and market volatility is now back to normal pre-recession levels. I'll believe it when Obama is out of the WH. LOL...If the Fed injects trillions of new money and credit in the economy and buys impaired debt from bankrupt financial institutions I would expect the VIX to go down, particularly when Bernanke has told investors that he will keep rates low and keep devaluing the currency to get the asset markets to go up. The fact that the VIX is as low as it is but that oil, gold, and silver are as high as they are speaks volumes. Too bad the cheerleaders are tone deaf and do not hear the siren's song. 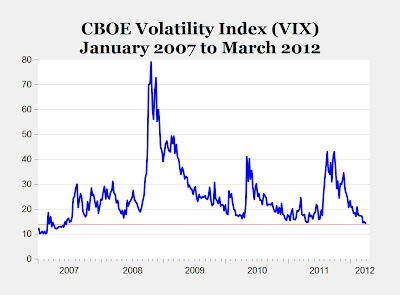 The lower the VIX goes, the more likely that a surprise causes it to jump way up. i am astounded that people try to use the VIX as a predictive indicator. it has NO predictive ability. it tells you nothing at all apart from the implied volatility on cboe options for the S+P 500 stocks. the vix can stay low for long periods. it's always very low at market tops. it tends to be high during panics, but subside long before bottoms. it is a USELESS indicator for market timing. try running the regressions. it's useless as a sentiment indicator as well for the most part as all it tells you is what has happened in the last few months. it's a trailing indicator and if it has nay forward predictive value, it's contrarian. this is a badly misused and misunderstood index. the media loves to portray it as a "fear gauge" but then, if you use the media to tell you about markets and the economy, i guess you deserve what you get. 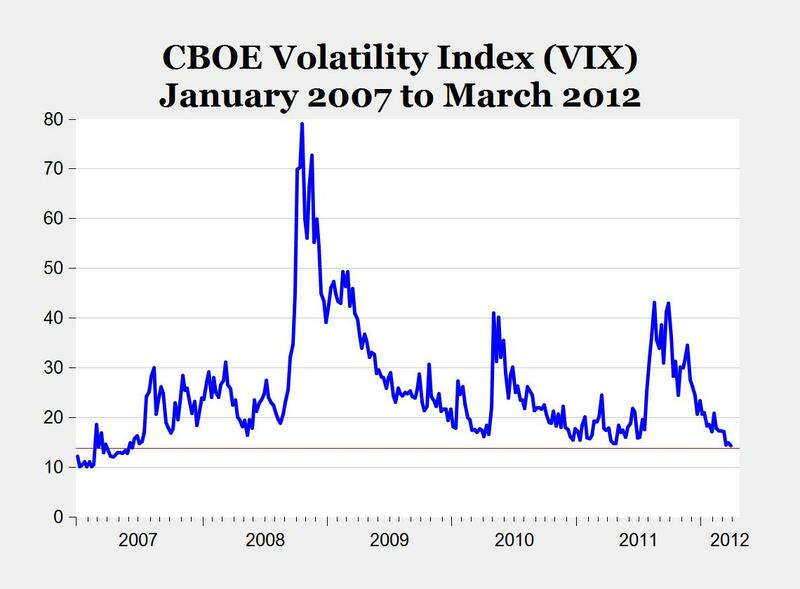 i seem to recall the vix dropping to about 15 in mid 2008 as well. this index is telling us nothing of predictive value. Equity market volatility has led to many ETF and ETN that buy VIX futures. Exchange traded products offer VIX futures of one to seven months, both long and short (some double short). One of these products, the ETN TVIX, is at the very low end of a trading range of $5.84 - $109.17. TVIX is double short and doesn't seem to like implied future calmness. At Seeking Alpha a contributor writes "Is VIX A Value Play?". Incorporating the work of Mark Perry, the author concludes investing in VIX futures products is too expensive to be considered a "value play". Implied future market confidence might make a lot of these exchange traded products disappear. Dr. Mark J. Perry is a professor of economics and finance in the School of Management at the Flint campus of the University of Michigan. Perry holds two graduate degrees in economics (M.A. and Ph.D.) from George Mason University near Washington, D.C. In addition, he holds an MBA degree in finance from the Curtis L. Carlson School of Management at the University of Minnesota. In addition to a faculty appointment at the University of Michigan-Flint, Perry is also a visiting scholar at The American Enterprise Institute in Washington, D.C.